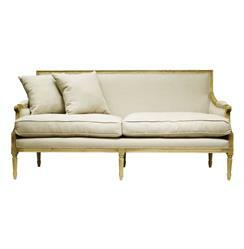 Overstuffed cushions lend an informal touch to this elegant Louis XVI style sofa. Upholstered in natural linen, its natural oak frame and fluted legs are embellished with decorative carvings. Set of 4 pillows included (2 larger pillows not shown here).